Just like testing websites across browsers, you also have to test HTML e-mails across e-mail clients. Most e-mail clients map well to specific browsers; for example, you can test Thunderbird in Firefox, Apple Mail in Safari, and various webmail clients in whatever browser is being used (Chrome, Firefox, Safari, Internet Explorer, and so on). The free Windows Live Mail (the successor to Outlook Express) uses Internet Explorer’s HTML rendering engine. Outlook is an exception, as you might think that it uses IE’s rendering engine, but it doesn’t. As of Outlook 2007, it uses Microsoft Word’s / Office’s rendering engine. If you don’t have access to Microsoft Outlook (or Word / Office) you can download Word Viewer, which gives you read-only access to Word documents but will also render HTML for testing purposes! 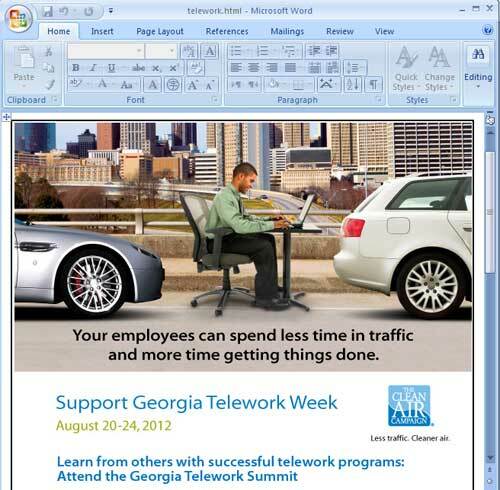 Extracting images from a Word document: don’t use Word! Use OpenOffice.org!